Trampoline Park – Zero Gravity Zone is one of the first trampoline playgrounds in the Philippines. With one simple concept of bringing together people of all ages to get active and fit while having fun. The warehouse turned park hosts to many attractions which include flying in the main court, getting into an intense game of dodgeball & volleyball, diving in a huge foam pit, getting the highest slam dunk or enjoying fitness classes like Gravity Zumba and parkour. Trampoline Park is located at The Portal Mandaluyong City. Just walking distance from the Shangri-La Mall. To enter the park you need to purchase Trampoline socks (P80) that come in a pair. The rubber grip on the sole prevents slipping on the tramp. You can wear them again on your next visit. They have a cafe and open area for guests where you can rest and keep your belongings. The trampolines are bog-standard garden trampolines and their framework is surrounded by ASTM approved cushiony soft padding. All of the trampolines are floor level which leaves nowhere to fall off from. Each participant will have to pay *P320 for an hour inside the park. Before bouncing all participants are required to sign a waiver that informs and educates them of the potential risks of trampolining. 15 minutes before the start of their jump session participants are required to watch an educational safety briefing video which teaches them about the park rules, how to control their bounce and how to jump safely amongst others. Court monitors are stationed at all core areas of the park throughout a jump session to ensure rules are being adhered to advise and guide participants. The Main Court is the biggest area where you can jump till your hearts desire. Feel the thrill in the air when you dunk like a professional NBA player. There are three different heightened lanes so that jumpers of all ages and skill levels can enjoy. Parkour instructors are free to teach you the proper and cool moves around the area. The best place to try your first backflip is in their huge foam pit. The instructors were cool enough to teach me my first backflip, and yes it was a success!!! Gravity Dodgeball is played with two teams with 6 players on each team. The objective is to hit the other team players with the softballs until the last man is standing. Enjoy classes like Gravity Zumba, Gravity Fitness and Parkour. Every Friday & Saturday night when the clock turns 8 and the lights go down, the fun and music begin during the Gravity DJ Beats. Ages 13 – 25 can dance and jump with the resident DJ playing old school music or the hottest hits. 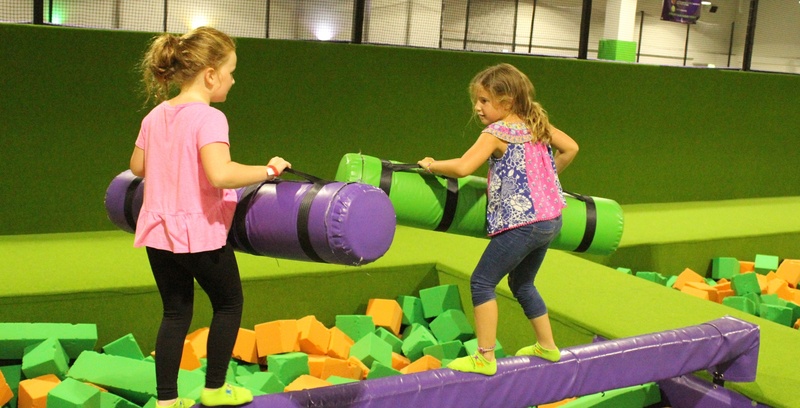 Trampoline Park – Gravity Zone is a great experience for kids, teen and those kids at heart! We loved there are a lot of activities and classes you could do with trampolines. Be sure to bring extra clothes, and who knew that jumping around could be such an exercise.